Following the heritage of the art of making whisky, our truly unique 'tasting trays' have been exclusively made for the Highlander Inn by a local master craftsman. They represent the tradition of making whisky; the wood is 30 year old solid Scottish oak to represent the casks, the discs are copper to represent the stills, and the Glencairn glasses are now globally recognised as the best whisky nosing and tasting glass. Order up a tray (flight) by menu number - or make up your own selection of 6 different whiskies from our extensive Whisky List. Enjoy a tray single-handedly, or share it between two of you, the choice is yours. 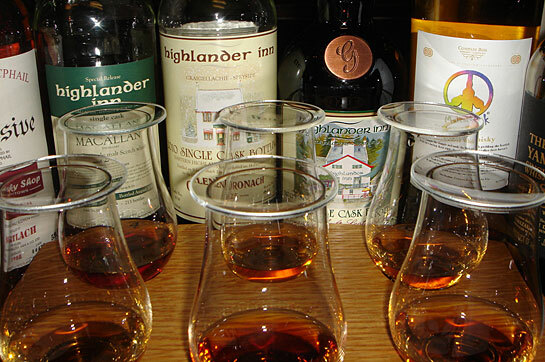 Currently we have over 430 different Whiskies available to buy by the nip.